This dissertation project is propelled by the motive to contribute to the interrogation of how actors in urban design can regain capacities to act and thus enable urban potentialities. The analysis starts from the assumption that project management in urban design has gotten shortchanged in its use as a technique to do more with less, making sound financial management and legal conformity of construction projects its sole purpose while pertinent urban issues like the infrastructures of ‘making it’ appear within reach yet remain unproblematised. The first goal of this dissertation project is to make modes of understanding project management in urban design available for new project(ion)s. This is operationalized in the form of a project archaeology: A technique for reading pertinent traces in the virtual and dispersed archives of project management in its becomings. 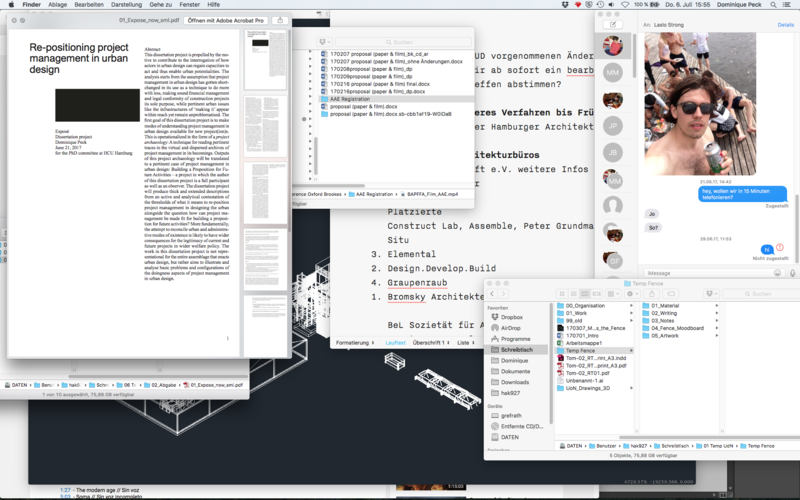 Outputs of this project archaeology will be translated to a pertinent case of project management in urban design: Building a Proposition for Future Activities – a project in which the author of this dissertation project is a full participant as well as an observer. The dissertation project will produce thick and extended descriptions from an active and analytical contestation of the thresholds of what it means to re-position project management in designing the urban alongside the question how can project management be made fit for building a proposition for future activities? More fundamentally, the attempt to reconcile urban and administrative modes of existence is likely to have wider consequences for the legitimacy of current and future projects in wider welfare policy. The work in this dissertation project is not representational for the entire assemblage that enacts urban design, but rather aims to illustrate and analyse basic problems and configurations of the doingness aspects of project management in urban design.